Front (L-R) Paul Mulay, Brian Kuntz, Terry Lehr, Scott Callahan, Jim Haas, David Albright. ∙ WY Captains - Gary Bates & Brian Kuntz. Rick Albright & *Don Lehman. 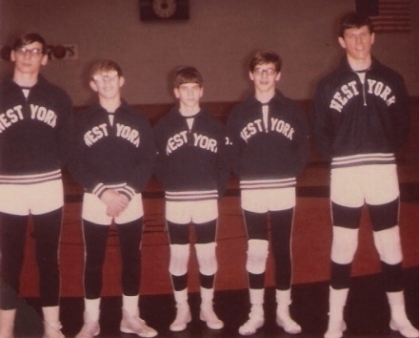 were 9-0 - '69-70 WYJH season duals. West York Junior High mat campaign!